There were anecdotes of a large quantity of military surplus equipment being bulldozed into a ditch after the Canadian Engineers left Dunsfold – I am unsure if this related to the end of Construction in 1942, or after the War activities. Does anyone have any first, second or third hand knowledge of this? As I understand in 1942 it the main concrete preparation area was to the South East of the airfield alongside the canal and with the existing road used for access. I wonder if that would be a natural place to dispose of surplus. I would also speculate that each dispersal area accumulated an awful lot of junk from use as maintenance areas for aircraft positioned there. Has there been an archaeological survey of these areas and the woods beyond? Secondly, the aerial view from just after construction was complete shows a wide strip of disturbed ground perfectly aligned alongside, and for almost the entire length of the main runway? It almost could be concreted., as if they had originally built the runway in the wrong place and abandoned it at the East end. Why was it there, and what was its initial purpose? In the mid-1980’s as a site photographer I took regular shots of the stretch ( ‘ pound ‘ ) of canal there being restored by BAe, to be re-filled with water, and fish for the Social Club Angling Section. In the process, lots of military stuff was recovered; it seems in wartime priorities were somewhat different to nowadays. The chap contracted to BAe to do the dredging had a small digger on a raft; when he began to dredge up bombs, BAe had a good answer, and produced a document for him to sign, ‘ If I get blown up it’s all my own fault ! ‘. He also recovered large pieces of a B-25 from WWII, reminding everyone of a sad story; they were returning with a ‘ hung up ‘ bomb which would not release – the aircraft Captain gave everyone the option to bail out, but they voted ‘ We’ll stay with you Skipper ‘ – on touchdown the bomb fell out and exploded. The crew were buried at the air forces cemetery, and the wreckage shoved into the canal. When it was recovered in my time, someone very skillful made some tiny B-25 models from it, but personally I didn’t want a part of something brave guys had died in. Thanks Andy. Valuable memories indeed. 8 September 1944: A North American Mitchell II of 98 Squadron RAF carrying bombs and exploded on touchdown, killing all the crew and badly damaging the runway. Re: the “ghost” runway. 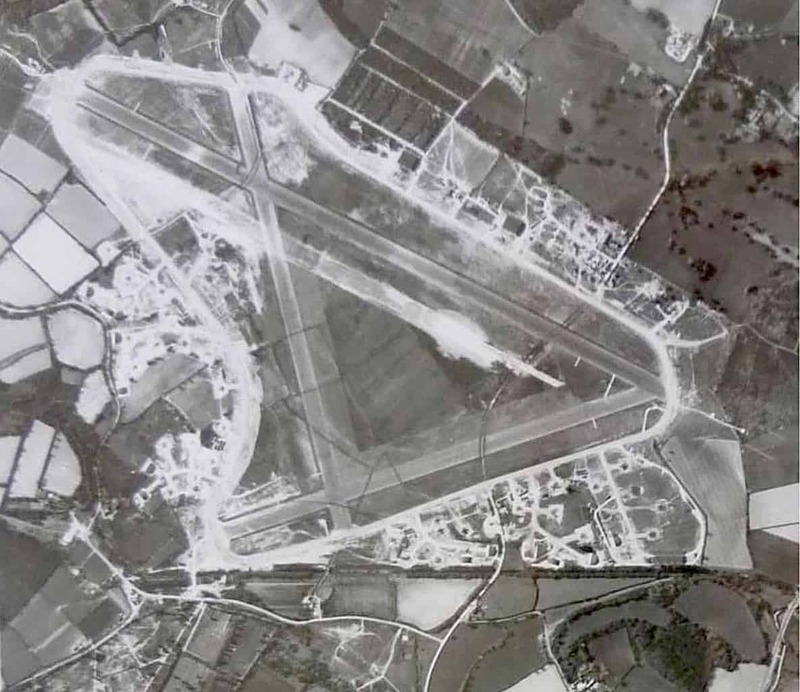 I have added two aerial images from 1942 of the runways and the ghost appears on one and not the other. In the image linked-to in the first post on this thread, I don’t think the runways have been concreted yet…you can clearly see the original roads running north-south across them. Perhaps the ground has simply been levelled out at this stage? How interesting to see what appear to be bomb craters to the south west……fox holes for defence? Might the ‘ghost runway’ be intended to allow landing and take-off at the same time, in the way that Heathrow has parallel runways of the most commonly used runway for the same reason? 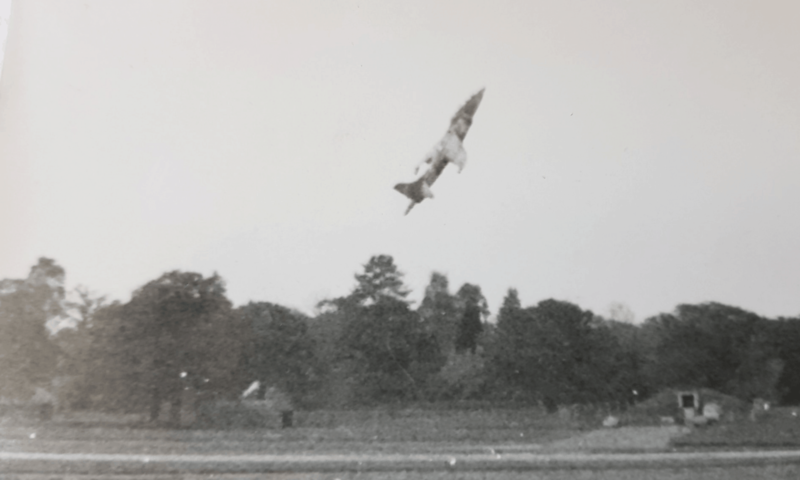 It might have been deemed unnecessary for aircraft flying to Europe and thus abandoned….or it may have been created to allow multiple take-offs to save ‘forming up’ time………. ?